Becoming cyber resilient will give your organization the best chance of defending itself against and surviving from cyber attacks. What does ‘cyber resilience’ mean? Cyber resilience is the ability to repel cyber attacks while protecting critical business assets, rapidly adapting and responding to business disruptions and maintain continuous business operations. 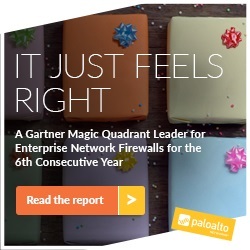 So how do I become Cyber Resilient? 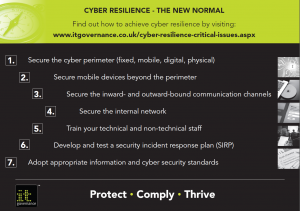 IT Governance has developed a 7-step approach to achieving cyber resilience. See the graphic below and click to enlarge. These standards will help you to implement a management system that will allow you to take advantage of the opportunities associated with operating in cyberspace whilst mitigating the threats and risks. Includes the information security standards ISO27001 and ISO27002 and the business continuity standards ISO22301 and ISO22313. Developing knowledge of the best practice advice and guidance in the key standards ISO27001 & ISO22301 is key to delivering a successful cyber resilience strategy. Whatever your preferred method of learning, IT Governance have the products to help build the knowledge and skills you need. An Introduction to Information Security and ISO 27001 (2013) Written by acknowledged ISO27001 expert, Steve Watkins, this pocket guide introduces the principles of information security management and ISO27001. This guide will help you understand how to start planning a project to implement effective, reliable and auditable systems. ISO22301 – A Pocket GuideISO22301: A Pocket Guide will help you understand the Business Continuity international practice, and provides guidance on the best way to implement a fit-for-purpose BCMS.